I am a trained Aromatherapist and create synergistic blends of oils to suit my clients and whatever the combination, a beautiful scent fills the room. The oils have their own therapeutic properties that promote good lymphatic and blood circulation, muscle relaxation and are calming to the nervous system. The Aromatherapy massage is more gentle and uses relaxing effleurage strokes, however I vary the pressure of the massage to suit my clients. 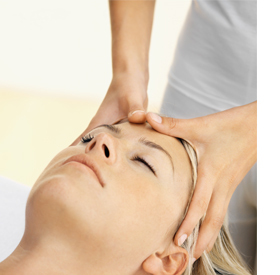 I am trained in Swedish Massage and Indian Head Massage also so if you are feeling a build up of tension in the neck and shoulders or tightness in the body, a deep massage may be the treatment of your choice. I have very good results with massage and it is a popular therapy.